Identifying habitats that should be protected from further disturbance or conversion and isolating high-risk areas is a focus of community habitat plans in southern California shrublands. Larger wildfires are occurring at shorter intervals in recent decades, contributing to degradation and conversion of shrubland vegetation. Multitemporal remote-sensing approaches can bridge the gap between vegetation mapping and field sampling in habitats where frequent quantification and mapping of vegetation growth forms over large extents is required. 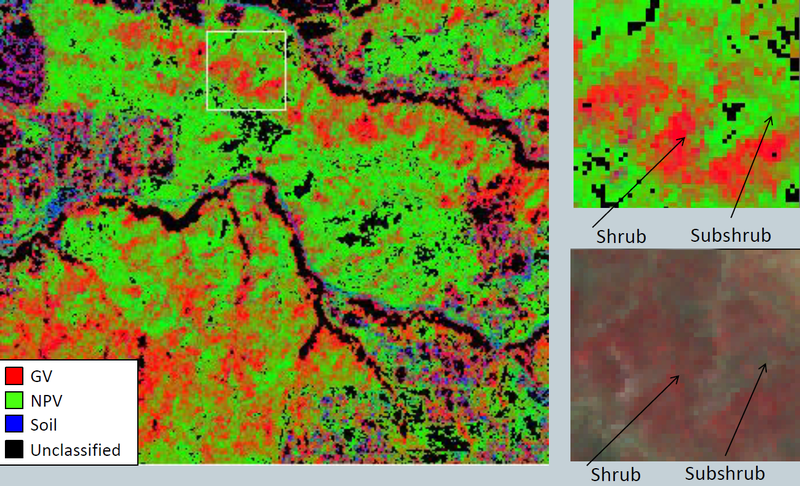 The objective of this study is to examine the reliability and stability of a multiple endmember spectral mixture analysis (MESMA) approach with moderate spatial resolution imagery for monitoring changes in growth form fractional cover in shrubland habitats. Estimates from visual interpretation of high spatial resolution image were used as reference data for validating MESMA-derived maps and as basis for providing complementary monitoring protocols that may be accurate and cost-effective across multiple scales. Growth form proportions modelled in burned and unburned management areas compare well with expected fractional cover in mature and regenerating shrublands. In themanagement areas recovering from fire, herbaceous cover fraction exceeded 0.40 for all three study dates, suggesting that large portions of those management areas may already be invaded. From 2008 to 2011 overall herbaceous cover fraction in shrubland area increased by 2%. Herbaceous cover fraction was modelled with an overall mean absolute error (MAE) of 0.08, a smaller percentage than the percentage of herbaceous cover change recorded in areas recovering from fire (increase in herbaceous cover fraction from 0.09 to 0.13). This MESMA approach would be effective for quantifying changes in fractional cover that exceed 0.10, providing a way to delineate and quantify herbaceous invasions and expansions following disturbance or succession.